We were on our way to Aysgarth. Our mission was to take pictures of the rock garden there, that magnificent crazy pile of stones. We drove through soft picturesque sylvanYorkshire Dales countryside. I cannot find words to describe its beauty in late May. We had been told that on the way there were some very good tearooms and stopped for morning coffee. 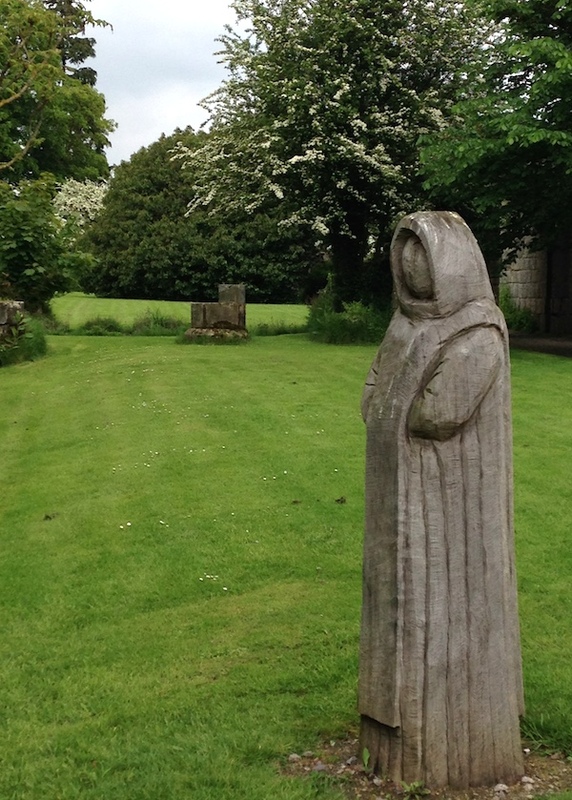 Apparently across the road there were the remains of an old Cistercian Abbey. Those ancient stones were to make our day. Peter and I regarded it a small penance to be dragged round old ruins by Brenda and Julie. In the event when we saw that they were clothed with wild flowers you could not drag us away. 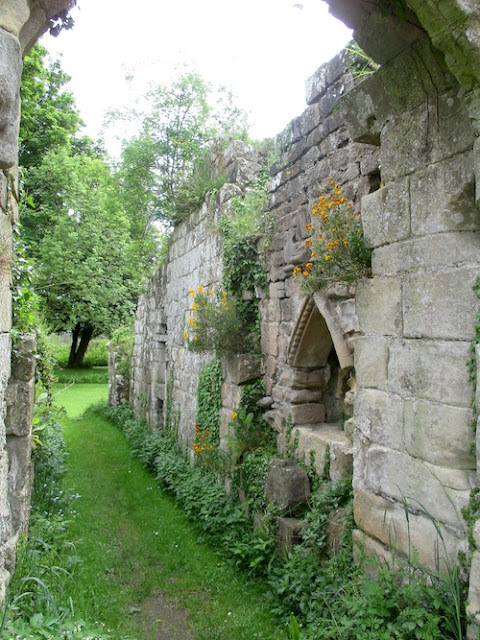 Jervaulx Abbey is privately owned by the Burdon family. It is magnificently managed and stands proud in accessible sheep grazed fields and light rural woodland. There is no intrusive visitor centre typical of other places. Since 1982 it has been honesty box payment. With enthusiasm we paid our three pound donation on exit. In point of fact the aforementioned tea rooms is also a visitor centre and un-intrusively provides all you need to know. Julie had bought their guide. To those interested in real history it is very informative. 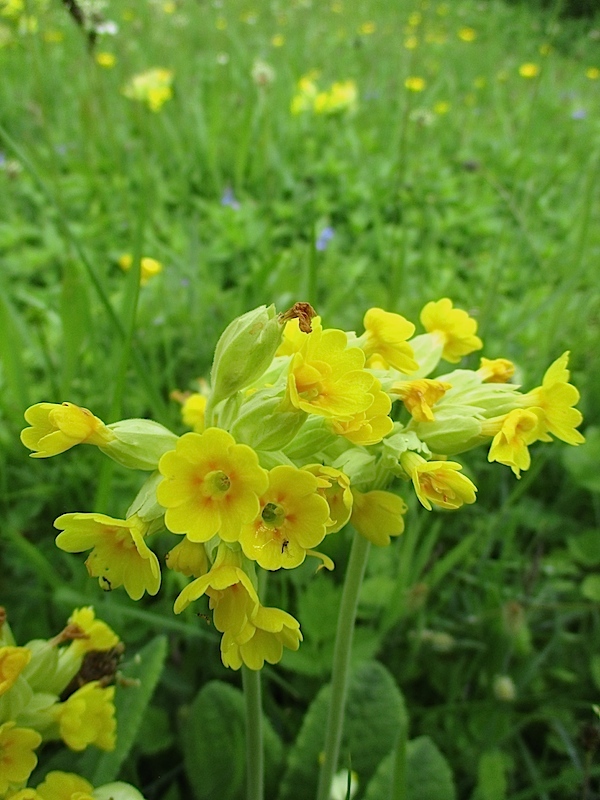 Of the fantastic wild flowers not a mention. Most old abbeys are normally maintained free of vegetation. 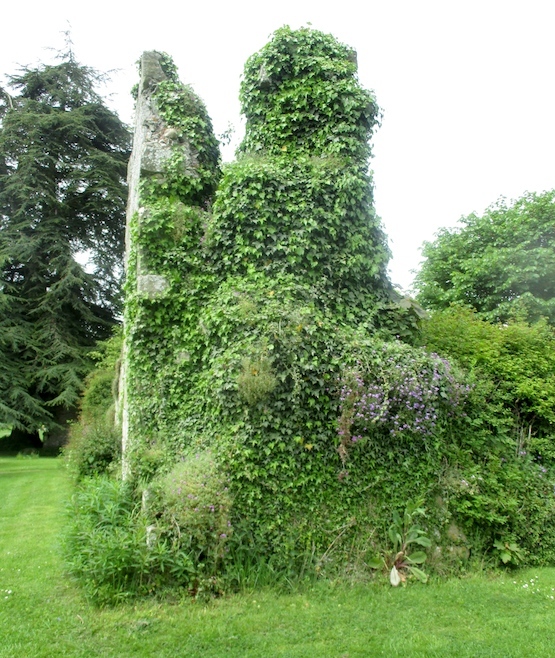 At Jervaulx their policy is different and they take the view that clothing ruins with vegetation might help to preserve them. It certainly enhances their beauty. The management of vegetation must of course be very sensitive. Rampant brambles, nettles and oversized seedling trees would cause severe damage especially if mechanically dragged away. All are actually present but in the refined company of more select wild flowers. There is sensitive and highly skilled management and selective removal by pruning and dare I speculate, spot treatment with herbicides. I don’t know for certain, but Peter and I think we spotted a nettle chemically withered! There are many fine old monuments, old churches and abbeys where an historical record and native flowers have been destroyed by removing natural vegetation in a tidy system of management. Not here now. At Jervaulx the mixture of shrubs, trees, wild flowers and garden escapes on the stones are actually quite ordinary. Only a few are rare and the ferns in the cracks of the stone are quite special. The real genius is in how they combine. Nature has put them there but man has maintained the illusion of wildness. Whoever maintains the vegetation at Jervaulx is a genius! There is no mention of he or she in the literature but from month to month and year upon year their is a delicate touch on the tiller. It would be nice if in due course any reader who really knows the secret of Jervaulx will enlighten us. I can spot nettles, brambles and hazel. Can anyone identify the fern? 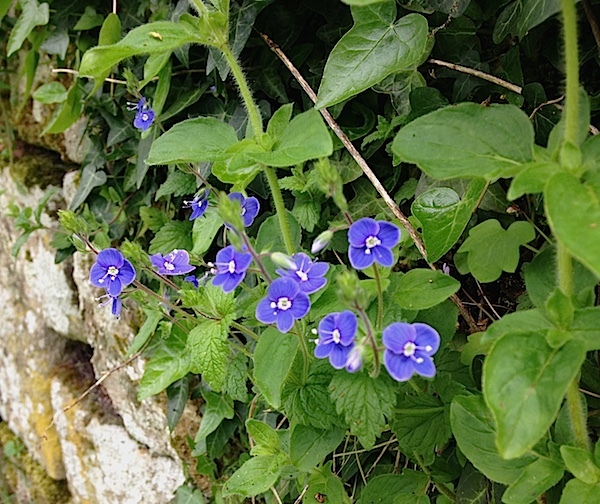 How could anyone pull out lovely speedwell? It looks a little precarious! Is the ivy holding things together? As kids we called them chimney sweep brushes. I wonder if they descend from the monk’s herbs? In April I wrote a post about pin and thrum eyed primulas. We were at Fountains Abbey recently and although there wasn't as much vegetation there were wild plants growing from the walls and the jackdaws were making good use of potential nesting places. I'm not sure what they made of the wayward eagle from a nearly bird of prey centre recently spending a night amongst them. Readers should go to Sue's website to swot up on pin and thrum. They will need to to understand my currently garbled post in the making! Wow an eagle at Fountains! Is a nearly bird a kind of early bird? No it should be nearby. You make me so nervous that I keep making these mistakes. Yes I know what you meant. You nervous? Fascinating stuff Roger, wild flowers are probably not mentioned because they are taken for granted! The jumble reminds me of my garden, as for the fern I am sure I have one but no idea what it is. I also didn't know you could wax so poetical.....sylvan!! Hope I have got the meaning right of sylvan! Is it a shuttlecock fern? I don't think so, Sue. It does not look quite like the one outside my window which looks a tighter shuttle. Wild Flowers of New York are of great species and with a large variety. It certainly interests any kind of flower lover. Wild flowers are beautiful, fragrant and colorful. 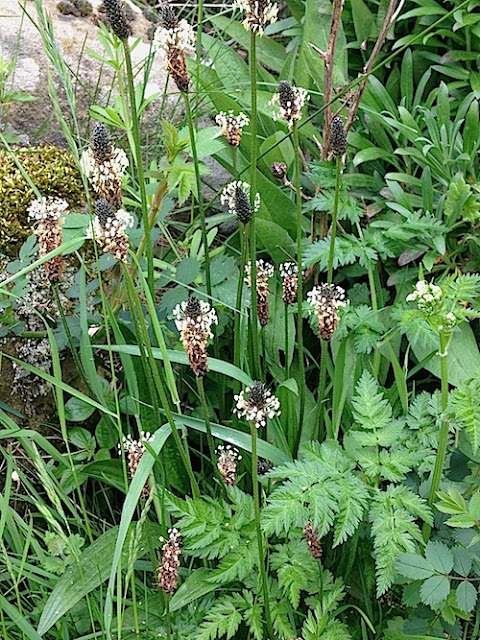 Wild flowers also can be grown in gardens as well. These flowers have mixed hybrid varieties that are grown in different colors and characteristics. Enjoyable post. 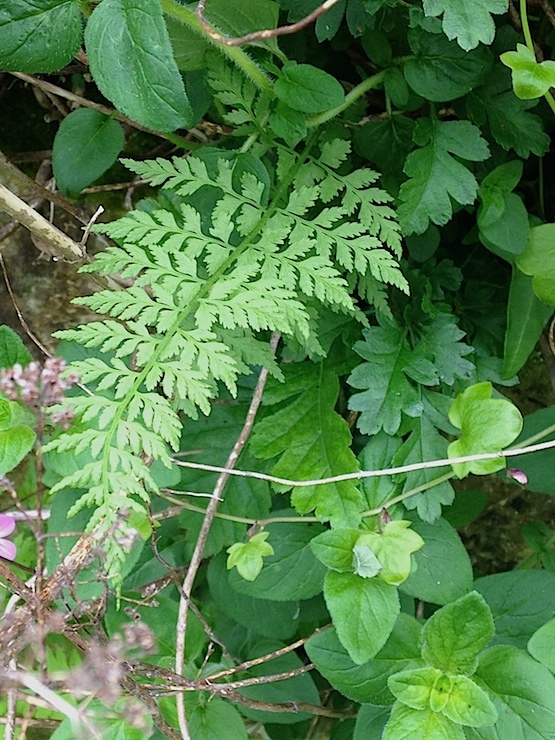 Regarding fern: newly unfurled fronds of the male fern, Dropteris filix-mas? Thanks for this Tom, dryopteris was on my short list but I did not want to publish my 'guess'. I am seeing Pete tonight - he might confirm. In due course I will enter the name on the post - I must look at some pictures on google images - although their plant identification means very little! You're quite welcome Roger, of course. 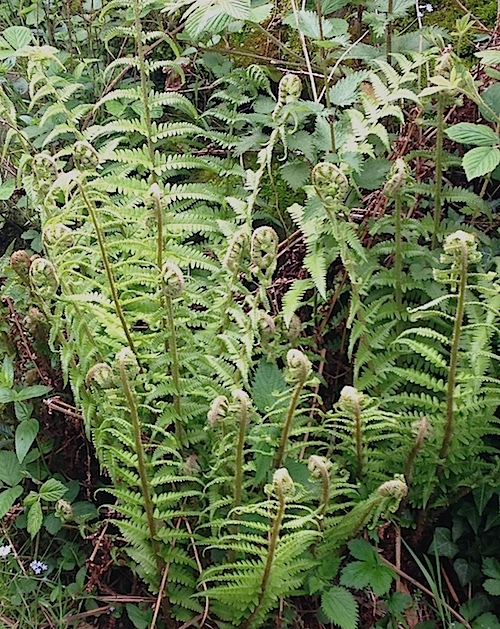 I was able to have a reasonable stab at the name as I live adjacent to a wood on the North York moors where Male ferns pop up all over the place, wonderful stately plants they are too. A small trial in your garden proves very little!